** (815) 520-4996***Find us on Facebook too! Willow's Cleaning Services was launched in late 2004. 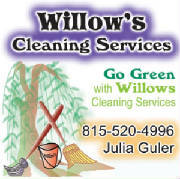 Founder, Julia Guler is the first "Green" cleaning company in our area and was a nominee in the winnebago county greeen business award in 2008,2009 and 2010.Willow's offers many services including, general weekly cleaning. detailed check lists,flexable hours,clutter removal and personalized cleaning to fit your home and budget.Willow's uses all natural non-toxic cleaners. Willow's logo- "It's Only Natural"
Willow's mission statement: "To Save Our Planet One Client At A Time!" I have used services of Willow's Cleaning Services since June of 2008.I would reccomend their service to anyone. Not only do they use products which are environmentally friendly (very important if you have allergies), but their cleaning is thorough,and the are vey outgoing and friendly. I have had cleaning services in the past but only had them for a few months secondary to unacceptable cleaning and / or questionalble trustworthiness. Willow's Cleaning Services by far is a Superior trustworthy service. Willow's Cleaning Service has performed house cleaning in my home for three years now. They do an exceptional job. The owner, Julia Guler , is always polite,punctual and attentive to detail. My home is alwasys left inexcellent condition and all of the contents are treated with respect.In addition to impeccable service, Julia also takes the time to solicit on-going feedback to insure customer satisfaction. Julia has been cleaning house for my housemate and I for nearly three years now and has always done a superior job,paying a lot of attention to details, taking great care of knick-nacks and other collectible items we have. Not only that but Julia has always been very easy to work with. And in fact I have often noted to her that I feel we've become friends as well as provider and client. THis has meant a great deal to me as I'm sometimes housebound. I have also learned a lot from Julia about being more organized in my living space. And lastly she has always been very understanding and has changed her schedule to help me out more times than I can count,and has always been willing to take on different household tasks as needed. Thanks, Julia! I highly recommend WILLOW'S CLEANING SERVICES. Iwas often gone when most of the "magic" happened at my house twice monthly. Julia, the owner and her assistant Wendy were prompt,trustworthy, quick ,thorough, and best of all--- used Natural Cleaning Products! Since I am allergic to many products and perfer a GREEN house, Willow's Cleaning Services was a great service for me. I also enjoyed interfacing with these women and becoming friends. I wish them much success. thanks for the welcome relief you bring. the cleaning you provide for my house is wonderful and well worth it. It is so nice to come home from work to a clean house – that doesn’t smell from cleaning chemicals! Willows does an excellent job at a very reasonable price! Rosanne K.
Willow's Cleaning Services . Servicing Rockford, Cherry Valley, Roscoe, Rockton, S. Beloit ,Popular Grove, Belvidere and Machesney Park IL. Winnebego and Boone Co. Thank you for saving our planet one client at a time!